Need a great indoor dog potty solution? You may want to take a look at our review of the Top 5 Indoor Dog Potty Solutions. One of the potties reviewed there is Fresh Patch. Fresh Patch was designed to be the ultimate “dog box,” and when first launched in 2013, it was a novel concept. But does it work well? I say "YES!" Here's my review of Fresh Patch Indoor Dog Potty and some helpful tips for how to use the potty most effectively. Fresh Patch looks way cooler than any "potty pads." The nice folks at Fresh Patch donated a sample Fresh Patch Indoor Dog Potty for my dog Scribbles to test out last week. 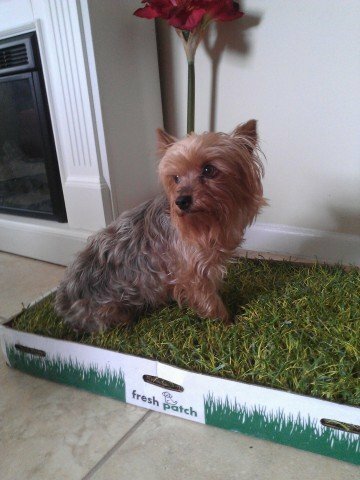 Upon introducing my ten-year-old Yorkie to the rectangle of real grass, she did what comes natural to a dog standing on grass. Successful product test! How Does Fresh Patch Work? When the potty needs replacement, you just throw away the old potty and replace it with a new one. The folks are Fresh Patch recommend replacing the doggy toilet every 1-4 weeks depending on the size of your dog. The box is coated with plastic so it does not leak. The grass is designed to absorb odors. It smells like fresh grass when new and is pretty much odor free until you need to throw it away. To keep it smelling fresher longer, you can just spray a little water on it to dilute any odors. The grass is specially designed so it the grass grows really tightly. It won't rip or tear apart easily. If your dog is prone to digging up grass, he will have a harder time digging up the Fresh Potty than lawn grass. But if your dog is persistent, your dog can make a mess of the potty. Do Dogs Like And Use Fresh Patch? Using Fresh Patch couldn’t be easier, and not only did Scribbles take to her new Fresh Patch like a fish to water, but I personally feel that she won’t have any “I’m not doing my business out there, it’s raining!” type accidents this hurricane season because of it. Scribbles wasn’t the only one who was curious about the Fresh Patch. 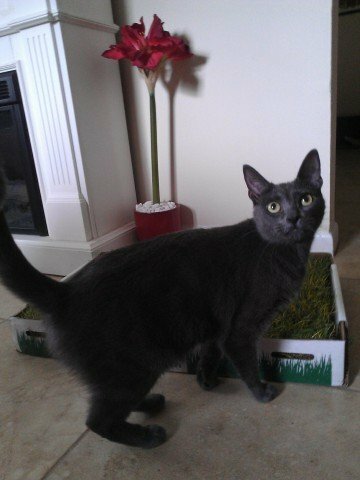 Since Joy is an indoor cat, she doesn’t get to enjoy the (dirty and flea-infested) yard, so she loved playing with and munching on the grass before Scribbles “used” it. Remember that Fresh Patch grass is grown hydroponically (indoors) without being contaminated by soil and bugs, so I was fine with Joy’s mini salad bar before Scribbles got to it. At least Joy has a new cardboard box lid to play with! All in all, Fresh Patch is an innovative idea that works extremely well because your dog already knows what to do with grass. If anything, you’ll have to teach your little buddy that it’s ok to potty in the house, as long as it’s on the grass! Fresh Patch is Scribbles approved! 1. If you are using your Fresh Patch outside on a balcony, the box can get wet and soggy. Use a rubber door mat or something to keep the box from sitting on a wet floor. 2. You can combine Fresh Patch boxes easily to make a bigger area for your dog. They are scored so that they can be attached easily to each other. It does not cost more since each box gets used less, you need to replace them less frequently. 3. Your Fresh Patch may arrive at your home a bit yellowed and stressed from being shipped. Just mist it with some water and put it out in the sun and it should look great again. 4. If you need a potty for travel, the Fresh Potty can be terrific for traveling with your dog. Just pack one up to take with you. 5. If your dog tends to chew the potty, you can order protective sleeves made of plastic for the box. The biggest concern with Fresh Patch seems to be the cost of getting fresh new boxes every few weeks. For some, the cost is well worth it but for others, spending about $1 a day for a indoor toilet for your dog may be too much. The second biggest issue with Fresh Patch Potty is the damage that can occur during shipping. 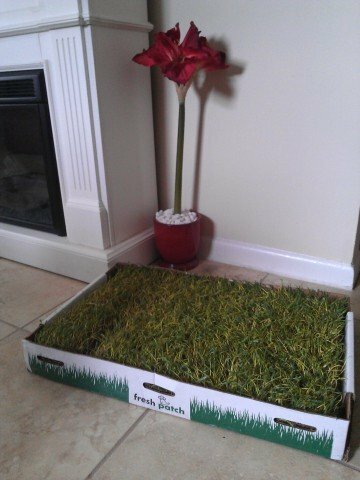 Shipping fresh grass may stress the grass and it may not always arrive looking perfect. You may get yellow or dead grass boxes. These experiences seem rare but if you live in a hot climate, the delivery process could end up delivering you wilted or dead grass. If you live in a harsh climate, there will be the small risk that your grass may not do well traveling from headquarters to your place. If you don't like the idea of having to buy a new potty every month and having it shipped, check out 5 Other Great Indoor Dog Pottys that we recommend. Overall, I highly recommend the Fresh Patch Indoor Dog Potty product. It can be a life changer for those who need a convenient indoor dog toilet and can afford the monthly fee. Originally published July 2013 and completely updated July 2015. I Believe That I Have Now Seen Everything. The Tortoise With a Wheel Animal Video of the Day!! !